(1 Customer Reviews) | Write Review 12 issues per year GCN’s brand new custom tablet edition makes for a super-interactive reading experience on your tablet and our mobile-optimised view makes reading about gay Ireland on the go even easier, giving you a greater connection to Ireland’s inspirational, world-class gay magazine. 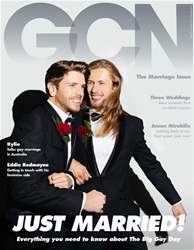 Since it was first published in 1988, GCN (Gay Community News) has been providing a uniquely Irish angle on LGBT culture, news, politics, entertainment, celebrity and lifestyle for a devoted readership. Published monthly, we have grown to become the most recognised and established gay magazine in Ireland, leading the way with top-rate journalism, fantastic production values and outstanding content. GCN’s brand new custom tablet edition makes for a super-interactive reading experience on your tablet and our mobile-optimised view makes reading about gay Ireland on the go even easier, giving you a greater connection to Ireland’s inspirational, world-class gay magazine. For almost 30 years, we’ve stood firm as the best-known and best-loved publication for readers who value us for exactly what we are: a one-stop, absolutely essential resource, and the ultimate authority on everything that’s happening in gay Ireland and beyond, leading the way with intelligence, attitude and Irish wit. GCN is a beautiful, up-to-the-minute, queer magazine that is never afraid to pull punches. GCN never fails to get right to the heart of what’s important to LGBT people today, while serving up the best in lifestyle and celebrity content too. You'll receive 12 issues during a 1 year GCN magazine subscription. You'll receive 12 issues during a 1 year GCN magazine print subscription.